So once again it is NowRooz – the Iranian New Year. A season of new life, green shoots poking through after the Winter. A time for partying and fun. A festival that started way back in pre-Zoroastrian times and has survived endless invasions and millennia of change. During the two weeks of Nowrooz, even the food eaten assumes certain symbolism. Reshteh, or noodles, are used in food to represent the strands of life and family coming together for the occasion. And herbs are used everywhere to represent the green of Spring. With best wishes for a happy and prosperous 1393. Photo borrowed with thanks from Kombizz’s Flickr stream under the Creative Commons Licence. 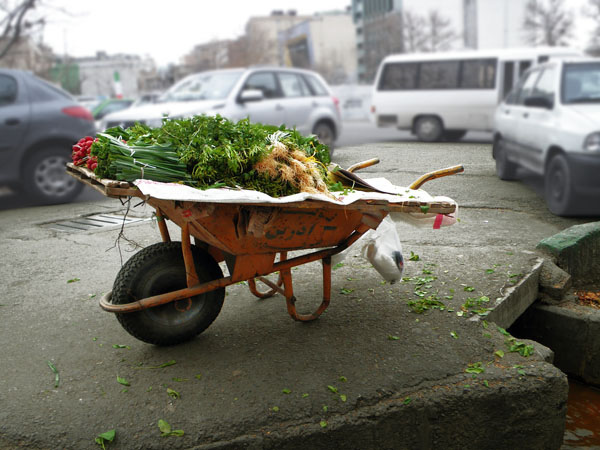 This entry was posted in Postcards from Veggiestan and tagged herbs, Nowrooz, sabzi khordan, Tehran, wheelbarrow sale. Bookmark the permalink.